"Steam" Stewart Biography For Sale! 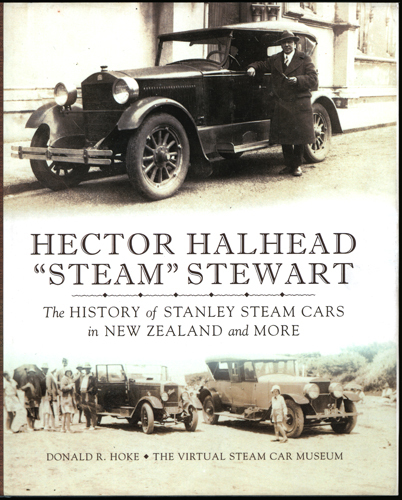 The biography of Hector Halhead "Steam" Stewart is now in print. Its 638 pages and 500+ illustrations document the career of Stewart from his birth in the bush to his death in Auckland in 1950. Stewart built his first steam car from a burned up Locomobile, imported Stanley Steam Car to New Zealand, spent three months in Newton helping to design the 1925 SV Stanley, worked with Doble in Detroit on motor busses, and brought Doble to New Zealand to build steam busses in Auckland. The book is based on an extensive archive of Stewart's papers, most of which are published. The book is available at the Vintage Steam Products web site. www.vintagesteamproducts/t/books. The Virtual Steam Car Museum, Inc.